Another bad Universal SE monicker, hopefully it'll at least be animorphic, like the re-issue from just some months ago failed to be. Today, we've got a sneak peek at MGM titles on the way for September and October. On 9/7, look for a David Lean Collection (SRP $99.96) including Blithe Spirit, Brief Encounter, Great Expectations, In Which We Serve, Madeleine, Oliver Twist, The Passionate Friends and This Happy Breed (which will also be available separately at SRP $19.98 each). We also have confirmation of the titles coming in November as part of MGM's Alfred Hitchcock promotion from the studio. 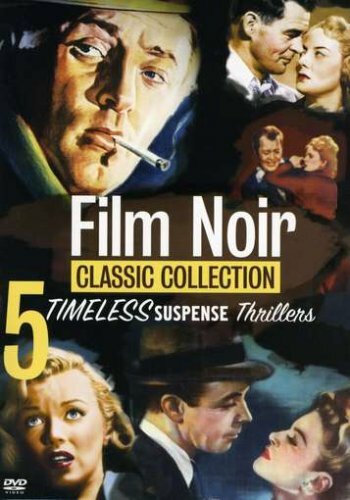 These will include The Lady Vanishes, Notorious, The Paradine Case, Rebecca, Sabotage, Spellbound, The Thirty-Nine Steps and Young & Innocent. They'll be available in a box set and separately as well. Just so you know, because we know you'll start asking, we don't know what any of the above means for Criterion's current releases of some of these Lean and Hitchcock titles. You might, however, want to pick the Criterion discs up if you haven't done so yet, just in case they do go out of print. Looks like its been moved up to July 7th, by amazon. its also only $35. That's the box art? Beautiful. And Warner has officially announced the DVD release of Scooby Doo 2: Monsters Unleashed for 9/14 (SRP $27.95). The film will be available in both anamorphic widescreen and full frame versions. Extras will include 10 minutes of deleted scenes with director's commentary, 2 behind-the-scenes documentaries (including True Ghoul Hollywood Story and Dancing Dog), the Triple Threat featurette, the Scooby-Doo Monsters Challenge and Behind the Mystery: The Mystery of the Missing Pants interactive games and 2 music videos (for Big Brovaz' Thank You Falletin Me Be Mice Elf Again and Simple Plan's Don't Wanna Think About You). I've been waiting so long for this! Man, thanks xixax. Fox Home Entertainment has announced the region one release of Bill Cosby Himself which is a new disc featuring Bill Cosby's 1983 stand-up performance in Ontario, Canada. This two-hour show will be available for the first time on DVD from the 10th August this year, and should retail at around $14.98. You can expect both widescreen and full screen presentations to be included on the disc, along with the theatrical trailer for the show. News on a "Clerks" 3-Disc Anniversary Edition!! For years, fans have craved a Special Edition, and it seems now to mark it's 10 anniversary, Director Kevin Smith and Buena Vista Home Entertainment will release a 3-disc set, for the cult favourite, Clerks. Although nothing official can be confirmed from Buena, DavisDVD.com got their hands on some news today on the set. Take it for what it's worth for now, but these preliminary specs do sound quite genuine. Here's what to expect: a new and badly-needed anamorphic transfer (from new high def master), a patented View Askew audio commentary track (featuring Smith and his usual suspects), deleted scenes, a new documentary and behind-the-scenes footage, the three-hour (!) Jay and Silent Bob Strike Back documentary "Oh, What a Lovely Tea Party," footage from the recent reunion screening and Q&A session at LA's Arclight Cinema, trailers and promotional material and tons more. They list September 14, 2004 as the release date, and if true, would be released on the same day as another Smith film, the recent Jersey Girl. For anyone who wants to take a look at the rest of the article, go here. The article also mentions that there will be an available branching feature, with the never-filmed "funeral party" sequence, readded into the film as a cartoon sequence. Man, I must have watched that 100 times on HBO as a kid. I have it all memorized, from "Come here. Here. Here. Here. Here. Come HERE!" to "Dad is great. Give us the chocolate cake." "Dad is great. Give us the chocolate cake." My friend's band used to do an arrangement of that song at their gigs. Warner Bros. has finally officially revealed that they'll street a 9-film DVD box set, The Alfred Hitchcock Signature Collection, on 9/7 (SRP $99.92). The set will include 7 new titles (Dial M for Murder, Foreign Correspondent, Suspicion, The Wrong Man, Stage Fright, I Confess and Mr. and Mrs. Smith) which will also be available separately for $19.97 each. The set will also include a 2-disc Strangers on a Train: Special Edition ($26.99 separately) and the previously released North by Northwest: Special Edition. All will feature documentaries and other extras.